Got a real special episode airing tonight. 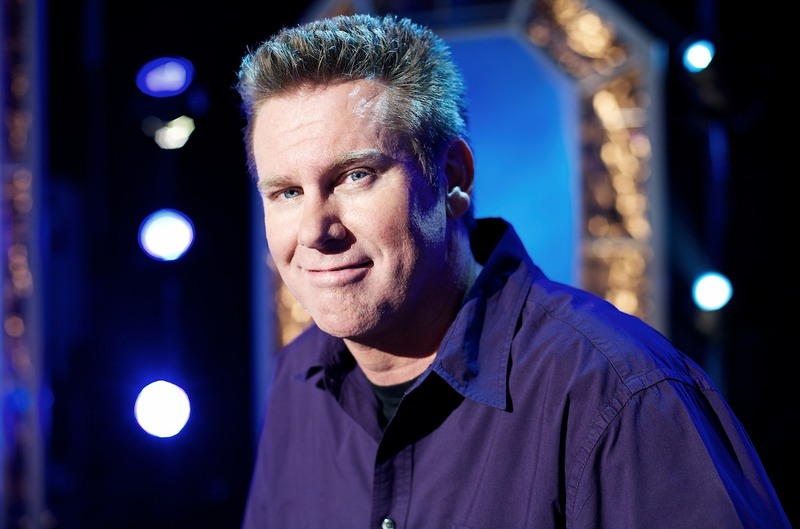 I got a chance to speak to Brian Regan when he was in town a few weeks ago. I've interviewed him via telephone a few times over the years for the Georgia Straight, but this was the first time we met. He agreed to sit down for What's So Funny? for half an hour backstage prior to his show at the Chan Centre. What a great guy. My challenge was not to tread the same old topics he always gets asked about. Sure, you might have heard some of this before, but maybe there's some new info to put into the world, too. We were given a very echoey room next to his dressing room so we sound like we're speaking from on high, but you'll get used to it. As always, we hit the air at 11 pm (or minutes thereafter) on CFRO, 100.5 FM in Vancouver. You can also streamline it from any point on the globe at coopradio.org. On the heels of the very popular Ewan Currie episode, we now bring you the Paul Anthony episode. I told you I was catching up this week. Paul visited us a couple weeks ago and talked all about the fun time he had on the new Arsenio Hall show. It was the best night of his life! (we need an irony emoticon) We also talked about his impending fatherhood, his confidence crisis about performing standup, and his latest film work. You'll have to guess which film it is and who stars in it because it's heavily bleeped. These things are top secret, afterall. I know Paul's been asked a lot lately about the Arsenio debacle. Now you won't have to ask him anymore. Just listen to the show. Either right here below or check it out on iTunes. Catching up on the podcast entries. I've got a flurry of them this week, starting out with Mr. Ewan Currie of the rock and roll outfit called The Sheepdogs. If you're wondering which Sheepdog he is, he's the long-haired one. They're a straight-ahead rock band; they don't sing funny novelty songs. 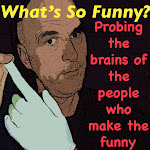 So why, you ask yourself, is he guesting on What's So Funny? Glad you asked: Because I asked him and he said yes. He's also a really big comedy fan. So big, in fact, he wanted to become a standup comedian when he was in high school. He even performed – and killed! – for his high school. Sure, it was using someone else's act, but you gotta start somewhere. To find out whose act it was, you've got to listen to the show. We also talk about his Aussie beginnings – yes, that's right, Mr. Saskatchewan was actually born down under – I plant the seeds of turmoil in the band, he opines on shampoo and Tim Horton's, and we play a home-made version of The $20,000 Pyramid. I perhaps should have explained the rules better. So have a listen. You can click below or, preferably, go download it at iTunes where you'll give us a star-rating and comment. It would be the decent thing to do. Little change of plans tonight, folks. I had originally planned on running an interview I did recently with Brian Regan. Then later this week I'm heading over to Victoria for the second annual Blue Bridge Comedy Festival where I'd record an episode with Ryan Hamilton. But when I heard Ryan was in Vancouver and not sailing to the island until Tuesday, I thought we should have him in the studio to get the full What's So Funny? experience. And he agreed. Ryan has opened for Brian Regan so it all works out. We'll play Brian next Sunday and it'll be like Ryan opening for him again. If you don't know Ryan, you should check him out. He's hilarious. You should have heard the compliments coming from everyone exiting the Comedy MIX last night, where he headlined the weekend. He's been on Conan, Last Comic Standing, and been featured in Maxim magazine. And tonight, he's all ours. Tune in around 11 pm PT (I can never remember if it's Standard or Daylight but I know it's Pacific) to 100.5 FM in Vancouver or livestream the show at coopradio.org. Jeff McEnery has spent the last two years living in Vancouver. So what happens? We finally meet on the air and he tells us he's moving back to Toronto. That's a fine how-do-you-do. But I'm glad we got to talk before he left town. The rhubarb genius from Acton, Ontario, tells us about avoiding hard labour at all costs on the dairy farm, dishes the dirt on film sets he's been on, waxes poetic about Williams Lake, and, you know, stuff like that. This episode was catered by KFC: "We Do Weddings Right!" Have a listen by streaming below or head on over to iTunes and dowload the episode to your listening gizmo and take Jeff and me in your ears with you. We're gonna get busy tonight, folks. We've got local actor/comedian/host Paul Anthony in studio off his triumphant debut on the new Arsenio Hall show. Or something like that. As you may have read in the Vancouver Sun, Calgary Herald or watched on CBC TV, Paul won a contest to be on the famous sycophant's latest television vehicle and flew down to Los Angeles on Thursday to be on the updated version of the show he revered as a child. (Take a look at his winning video entry below – it's pretty great.) We'll find out if it's a good thing to meet one's hero. We'll discuss just how groovy he felt dancing to Johnny Gill. But there's more to talk about, too, such as the return of Talent Time, Anthony's monthly showcase at the Biltmore, and his newest baby Data Transfer. Tune in tonight for all the Hollywood gossip at 11 pm PT to CFRO 100.5 FM in Vancouver, or livestream the show at coopradio.org. We're rocking out tonight on What's So Funny? The Sheepdogs were in town a week or so ago playing the Malkin Bowl. Lead singer Ewan Currie is a big comedy fan so I thought that was reason enough to have him on the show. I do believe he's the first WSF? guest to have been on the cover of Rolling Stone magazine. We talked about that, why he likes to maintain an air of mystery, his brief career as a standup comic, shampoo, his distaste for Tim Horton's, and meeting Larry David. I also throw in a track from The Sheepdogs for good measure. We're on the air at 11pm PT on CFRO 100.5 FM or you can livestream it at coopradio.org. You may have noticed the change in description in the above banner a couple months ago. My how time flies. Yes, What's So Funny? was nominated for Best Podcast at the Canadian Comedy Awards. The five nominees were decided by jury – and hey, being nominated is as good as winning, right?! That's what I keep telling myself. But the actual award winner will be selected by... YOU! You, the people. If that sounds a bit like a popularity contest, I'm hooped. But we have our fans, too. And if each one of those fans goes to canadiancomedy.ca and registers to vote, then actually votes, and votes for What's So Funny?, and then tells two friends to do the same, and they each tell two friends, and so on and so on, we actually stand a chance! So what are you waiting for? It takes all of a minute to register, and even less to vote, unless you want to listen to the submissions for each nominee. You only have until 11:59 ET (8:59 PT) on Sept. 13 to make your vote count. I like that each nominee in our category is stylistically different. It's a great cross-section of what a comedy podcast can be. Also, three of the five nominees are based in Vancouver: us, The Sunday Service Presents: A Beautiful Podcast and last year's winner Stop Podcasting Yourself (the other two, based in Toronto, are Ward and Al and Illusionoid). The awards are handed out on Oct. 6. I'd love to go out to Ottawa to be a part of the three-day mini-festival and record some episodes, but that's an expensive trip (unless there are any sponsors out there who'd want to send me). But I'll be happy just knowing you took the time to vote for us. And if we lose and they don't announce who finished second, I'll be able to say I did. Because how would they know? Happy September! We are back in full swing with guests lined up all the way to the end of the month. Tonight we start our 9th season off with a first-timer. I've seen Jeff McEnery live a few times now but we've never spoken. I remember when he was a young Toronto comic who won the Yuk Yuk's national competition taking home a cool $25,000 in 2006. I wonder if he's got any of that left? Maybe that's how he can afford to live in Vancouver now. Anyway we're glad to have him with us. To remind you, the party gets started at 11 pm PST on CFRO 100.5 FM. Or if you're one of Jeff's fans or family outside the lower mainland, you can always livestream the show at coopradio.org. Well, look what we have here! Another podcast episode. I know they've been scarce this summer, but as guest Steve Bays says in this one, it was also the driest July on record. So maybe we were just trying to match the weather, guest-wise. Raw dawg Steve Bays makes his annual visit in this one and we had a good time talking about all sorts of things. Like what, you ask? Like his aversion to the definite article, for one thing. About what kind of nightmares he has. And why he'd invite Larry Flint to dinner. We also play a track from his new band's new album. That'd be Fur Trade with the song Kids These Days. His other band, Mounties, provides the brief intro: Headphones. No track from his third/first band Hot Hot Heat, though. It's not a rock 'n' roll show, kids. Take what you're given and be happy with it. In case you've forgotten the drill, just click below to start streaming the episode. Or, if you'd rather, go on over to iTunes or CastRoller or Player.FM or... you get the idea... and download it for convenient listening later. That works, too.